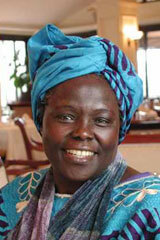 Mama Wangari is (our ancestors remain alive) a force of Nature and an advocate for Nature and all of humanity. If we don’t know about her life, her work and her legacy, we on RAW want to make you aware, acquainted with and want to inspire you to learn more about her and duplicate her work! Although she was honored with a Nobel Peace prize which made her well known world wide, her work and her legacy was already set as one of this centuries most notable pioneers and militant activist/and advocates for women and for Nature…for Africa’s future. As a side note, the Nobel Peace Prize and its name sake Alfred Nobel who thought of himself as a pacifist and inventor of dynamite…like Albert Enstein became “Merchants of Death”. 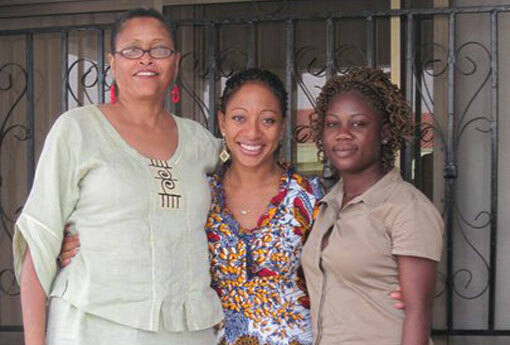 Picture includes Nana Yaa…AAWRU rep and CC member in Ghana. Why RAW? Where else can you find information on our Pan African world by and about Revolutionary women and men if we do not create the space for it ourselves? Our work of unity and organization, mentoring the youth and developing spaces for our elders inspires us every day to continue this journey and develop it beyond where we are today. That is why this space called the Revolutionary African Women’s website is important. But it is only important if African Women and Men find it, feel the need to say something, to reach out and have their voices heard. If we really care, here is a place to share what we care about as it related to raising our consciousness, organizing our community and our nation. It’s for tomorrow’s African woman and man, youth and elder, activist and curious soul who want to know more about ourselves, about our people and about the journey ahead. We want to inspire our people to find solutions to our many problems by dedicating ourselves to our worldwide African community and for us; we know that Balance is at the core of our work. We as women and girls especially, need to share our aspirations, struggles, victories and setbacks with each other and inspire all of us towards the light…the light of liberating energy that will give us that boost to write another inspiring work, teach another enlightening class or workshop, feed our community both physically and politically, fight the good fight for freedom, lift up another soul longing to do something positive for her and his people. This is part of the journey of liberation and how I and others envision RAW playing its part. Where there are areas of weakness, there is the need for organization. We want to bring organizations and individuals together who are about or want to be about the work of liberating our minds, hearts and spirits towards the manifestation of the physical liberation of Africa, our motherland! What could be a greater cause than uniting our people, educating and inspiring our youth?! Where can you find a place that brings our community together by sharing events and the conditions of our African people in various corners of our Pan African world? Here at RAW, that’s where! Maria de Lourdes Vale do Nascimento, a social worker founded the Brazilian National Council Black Women in 1950. The Council focused it's work on citizenship rights, access to public services and women's labor rights. R.A.W. Copyright 2011. All Rights Reserved.